Lush Fab Glam Inspired Lifestyle For The Modern Woman: Gossip Girl's Taylor Momsen Model's Madonna's Material Girl Clothing! Gossip Girl's Taylor Momsen Model's Madonna's Material Girl Clothing! Gossip Girl's Taylor Momsen Models Madonna's "Material Girl" Clothing! 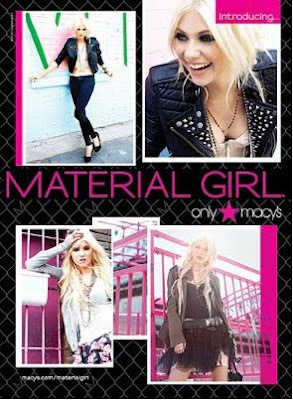 Check out the photos of Gossip Girl's Taylor Momsen modeling Madonna and Lola's new clothing line "Material Girl". Madonna has said that her daughter Lourdes Leon is the inspiration for the collection. "Material Girl" will be available exclusively at Macy's stores and online as of August 3rd, 2010. For all Gossip Girl fans, Taylor Momsen will be at Macy's on August 3rd from 5-7pm and for Madonna fans she will be at Macy's to launch the line on September 22nd. Will you be purchasing clothing from Madonna and Lola's "Material Girl" Line? Leave a comment.